Our Soda Jerk cap was traditionally worn by the “soda jerk“, the counter worker in an old fashioned soda fountain. This hat is great fun when making your favorite soda fountain treats. It is made of paper and fully adjustable to fit most heads. The black striped hat is the same as our traditional white hat but the thin black stripe gives it some extra flare. Looks great with our waist apron or bib apron. Also, it’s fun for kids to decorate any way they like. Save 20% off the 10 pack price. Buy five 100 packs (500 caps) and your price is only $12.48 per pack. Great price, quick shipment, exactly what we wanted. They were exactly what I had hoped they would be! 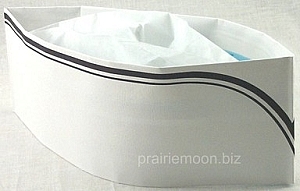 I ordered the soda jerk paper hats for a diner themed dinner theater at my childrens' elementary school. The quality was great and everyone loved the hats. They were perfect!